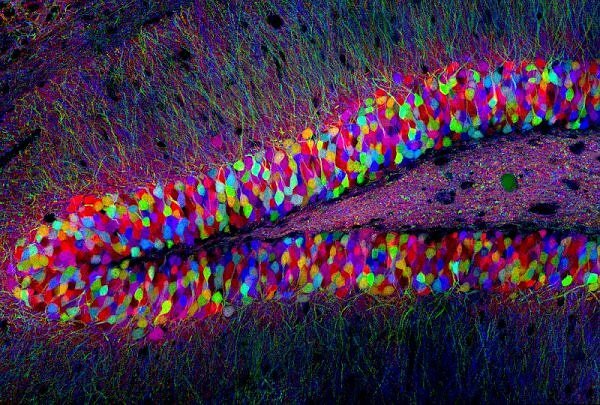 This is a picture of a brain that has been tagged in a process known as brainbow, where individual neurons are stained with different combinations of fluorescent proteins, leaving each neuron a distinctly different color and creating a rainbow. It’s estimated that there are about 86 billion neurons in the human brain. Each of these neurons has the potential to make connections to around 10,000 other neurons, leading to immense processing power. Despite a recent explosion in research, scientists still know very little about the processes that govern our entire minds. For the most part, debates and cutting-edge research still dominate the field. One area with intensely accelerating research is addiction, a field that I have been involved in for three summers. Around 6.2% of adults have an alcohol use disorder and the loss of life and economic burden that come with alcohol use disorders are devastating (1). Addiction has long held a profound stigma in society and those suffering from this debilitating disease are often looked down upon as lacking willpower or self control. This stigma prevents people from seeking treatment and further traps them in the cycle of addiction. Addiction has been a hot topic for the past several centuries, and its specific discussion in scientific literature can be found as early as the 17th century. The use of addictive substances, however, existed long before that. For millennia, some substances with psychoactive properties, such as mushrooms, were used by priests and shamans to create states of introspection and meditation. Other substances were used as medicine, such as opium which, up until two centuries ago, was recommended as a treatment for psychological diseases like depression. The recreational use of addictive substances also has deep roots in history. The first domestically cultivated vines used to make wine date back to 7000 to 5000 BCE. And, as it would be expected, the same patterns of abuse that we see today have been observed since these substances started to be widely used. Alexander the Great died in 323 BCE, after many years of what would be characterized today as an alcohol use disorder and many philosophers and physicians of the time discussed the disorder in detail (2). Throughout most of history, addiction has been seen as a personal shortcoming. Treatments were composed solely of talk therapy to try to change perspective and encourage addicts to stop using drugs altogether. It is only recently that we have started to realize that these old models of defining addiction do not tell the whole story. Addiction is not just a problem with the person, it is a problem with the chemistry of the brain. In the same way that we would not tell a person with a broken arm to just “get over it,” we have to stop treating addiction as something that people have total control over, and start treating it like the disease that it is. This recent switch in thinking is a result of new research that has been coming out in the field of neuroscience. These past three summers, I worked in the Ozburn Lab at Oregon Health and Science University, investigating the relationship between circadian rhythms and alcohol use disorders. The circadian rhythm is the daily cycle of changes that the body goes through in a roughly 24-hour period. Hormones, such as melatonin, are secreted and released, which helps to regulate rhythmic processes such as the sleep/wake cycle. When a person has an alcohol use disorder, they will also often have changes in rhythmic processes associated with circadian rhythm such as sleeping. Individuals are also more or less sensitive to certain drugs of abuse at different times of day (Perreau et al., 2008). The circadian rhythm is regulated by the Suprachiasmatic Nucleus, a region known as the pacemaker of the brain, and the molecular clock, which is a loop of genes that fluctuates rhythmically throughout the day. Researchers have identified many of the genes that are involved in the process, such as the Period gene, the gene my research was focused on this summer. The Period gene is known to be closely involved in the regulation of daily rhythms and the expression of the gene actually changes throughout the day. The reason that this gene is so interesting is that small changes in this gene have been linked to alcohol use disorders, which made it the perfect target for my lab. The main finding of our research was that binge-like drinking actually impacts the expression of the Period gene. Usually, the expression of the gene creates a wave that varies over time, with peak expression at certain times of the day. When mice were exposed to 8 weeks of binge-like drinking, however, the amplitude of the sine wave decreased, indicating that the rhythmic expression was reduced. These changes in gene expression were found both in the Nucleus Accumbens, a region important for stress and reward, and the Suprachiasmatic Nucleus. This research indicates that binge-like drinking influences expression of genes intimately involved in the molecular clock. More research still needs to be done, however, into whether reduced gene expression is a result of alcohol use disorders, or whether reduced levels might be a risk factor for the development of alcohol use disorder. The rhythmic expression of circadian genes controls how excitable cells in the brain are, thus, disruption of these rhythms changes the effect of drugs on the brain. Currently, the Ozburn Lab is testing treatments to “normalize” the molecular clock or bring back up levels of gene expression to see if this reduces drinking tendencies. This genetic identification can allow for new and more effective drugs to be developed to treat addiction. There are several drugs on the market right now, but most have a success rate of around only 30%. Additionally, most of the biological mechanisms that act through these drugs are not even fully understood yet. This type of research into the genetic origins of addiction is vital for developing drugs that can target and treat addiction, as well as creating better prevention methods. As we discover more about the brain, we will also be able to understand how to make medicine more efficient and effective, rather than believing that mental willpower alone is the answer to overcoming addiction. Older PostNeural Nets and Music: Can Artificial Intelligence Be Creative?